Marceline, MO - NOMO Gallery is hosting a show featuring BNSF Railroad Engineer Mark Steenwyk in conjunction with Marceline's Railroad Day on May 5th. Mark Steenwyk is a railroad engineer for the BNSF and has been taking photographs of trains for nearly 20 years. Looking through his Uncle John Steenwyk’s collection of videos and rail-fan slide photography inspired his passion for capturing railroad imagery. 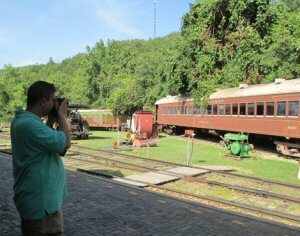 Mark enjoys meeting a wide variety of people on his trips, seeing different parts of the country, while capturing the evolution of the railroad industry. These pieces on display are some of his favorite shots from various trips ranging from 2004 to 2015. These photos cover multiple states and areas of the country. Mark hopes you enjoy viewing these images as much as he enjoyed taking them. The Sister Show, featuring locals Nora Othic and Barb Garvey, is also still on display in the back room of the Gallery. Both shows will be on display Monday-Friday, 9:00 am - 5:30 pm and Saturdays 9:00 - 1:00 pm, through the month of May. Saturday hours on May 5th are 10:00 am to 4:00 pm.